Welcome to Jerre's Service - Your #1 Choice for Blizzard Plow Accessories, and Upgrades. We service all brands of plows. "Your #1 Choice for Blizzard Plow Parts, Accessories, and Upgrades"
Attention Fisher XLS and Western Wide Out Owners! You must read more here about worn out wing edges! 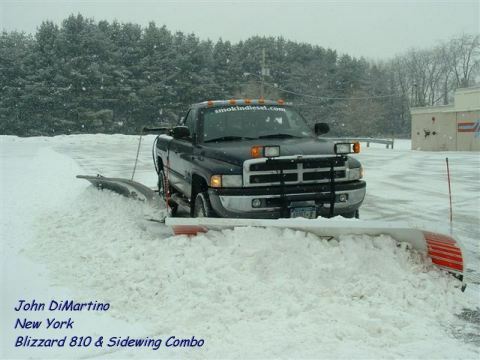 As a Blizzard Dealer from 2000 to 2008 we built and sold over 1100 Blizzard plows. That is not a typo, over 1100 Blizzard plows! Satisfied Customers? Yeah, we have them! Click Here for info on the "Erie Special"! There are 137 Erie Specials as of 2/22/2012 and counting! Though we are no longer a Blizzard or Western dealer or distributor, we sell, service, and repair / upgrade Blizzard / Western and all other brands of snow plows. We have a large inventory of Blizzard parts in stock, and will continue to stock them. We thank you for your past and continued patronage in choosing Jerre's to provide you with high quality sales, unsurpassed service, and the best upgrades that you, our customers request and desire. "Mission Coffee - helping to stay the course through the snow season"
"We work hard all winter, and spend the summer getting ready for winter ...........DO YOU?" Jerre's Service, LLC reserves all rights associated with all vehicle, plow, and equipment modifications listed on this web site.